Most of us think of a Bicycle Trailer as the thing that younger children ride in behind their parent's Bicycle. And those are by far, still the most popular. But you can also use those for more than just children and you can, now, buy Bicycle Trailers that are made (or make) for other items to be towed by a bicycle. If you look around on line you will find Bicycle Trailers made for Pets, Camping Gear, made to haul Heavier Items, and more. Bringing items home on a bike is not longer a person with a plastic bag over their handle bars, or Panniers on the bike....although I LOVE Panniers! Here is a list of Uses For Bicycle Trailers...maybe you still have a Child's Trailer in your Garage since your children have outgrown it. 2. Hauling Pets for a ride around town or to the Vet. 3. Hauling your Camping Gear while out Touring on your Bicycle. Whether it be for one night on a local trail, or across the Country, you will need some sleeping items and maybe some cooking items as well as clean clothing. 4. Taking home your Groceries from your ride to the Grocery Store. 5. Taking Trash to the Town Dump....line your Trailer well for this ride. 6. To carry your child's overnight items to take to a sleep over. 7. To take your Cat to the vet....better put kitty in a little crate first, then into the Trailer. 8. Delivering items to a neighbor. 9. The food you will be taking to the party you are riding your bicycle to. 10. Use a Bicycle Trailer for bringing home items from Garage Sales on a Saturday's Morning Leisure ride. 11. Babysitting? Take the child for a ride. It will be good for both of you to get out and get some fresh air. An older child will find the ride very exciting and fun, especially if it's parents have never taken it for such fun! 12. You could buy a used, even used up, child's bicycle trailer and use the frame to make it into a hauling trailer so that you could ride your bike more often even on errands around town. 13. Teach an older child to use the Trailer behind their bike and send them for errands around the neighborhood. 14. Or let an older child give your dog a ride in the trailer. Not only will they both have a good time, it will help burn energy from the child. 15. Fill up the Bicycle Trailer with weight, use a bag of dog food or camping gear, and get more of a work out when riding your bike. This is great training for getting ready for long touring too. 16. If you Re-Cycle a Bicycle Trailer to a Flat Bed Trailer, you could make a really KOOOOOL Parade Float for an upcoming Holiday in your Home Town. 17. Decorate your Child's Trailer and let your young children, grandchildren, or dog ride in it in a Home Town Parade. 18. If you ride your bicycle to work, on a rainy day, carry all your items, plus dry clothing in a sealed up bicycle trailer. 19. Go Fishing by bicycle. Carry your Fishing Gear, Chair to sit on, as well as a Cooler for Lunch, and another Cooler to bring the fish home inside of, in your bicycle trailer. 20. Are you riding over to a friend's or Grandma's House to visit? Take a couple of Lawn Chairs with you and sit down "a spell". 21. If you love to ride your bike and groom dogs for a living, pick up and deliver smaller dogs, inside the bicycle trailer....it would be great for business. Think of all the "Word of Mouth" advertising you would receive! 22. Do you Teach School? Be an influence on the kids by riding your bicycle to school. Bring your bicycle into the classroom one or more days and show and tell them all the benefits of riding a bike. Use the trailer to show and tell them what all they could haul behind them as they ride a bicycle. 23. Anyone could take a bicycle and trailer to a classroom and encourage kids to not only get out and ride a bicycle but to teach them the benefits of riding a bicycle to run errands and such. This would also give an "in" to talk about the cost of living, to budget, to cut back on luxuries to save or to use the money to keep up on their bills. Many, if not all, kids could USE a talk like this in today's world! 24. Offer to come to a Ladies Church Meeting or Town Meeting, or Men's Meeting, or any Meeting where they have people come in and give talks. Take your Bicycle and Trailer. Most people will LOVE to hear such a talk. A talk about exercise and saving gasoline and not driving in traffic to run errands. 25. Do you REALLY want folks to notice what you are doing for the Environment? Take your Bicycle Trailer and go out in your neighborhood and pick up trash. Take the trash to the Local Dump. People seeing you pulling into the dump on your bicycle with a trailer will make them THINK! 26. Carry that Pizza home flat and hot by using your bicycle trailer rather than your arms or panniers. 27. Fill up the Trailer with items you would like to get rid of after cleaning your home. Take the stuff to a Thrift Store. 28. Let a young person use the Trailer for their Newspaper Route. 29. If you have a business with items you sell that would fit in your Bicycle Trailer, offer to deliver the items to the folks that live near by. 30. 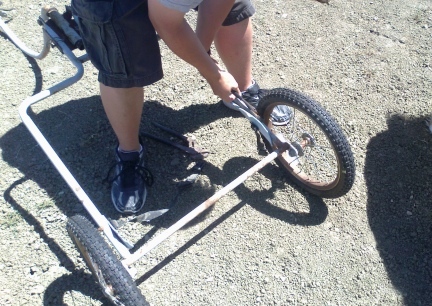 Start Repairing or Re-Cycling Bicycle Trailers for a little extra income. You could find or buy used Trailers, tweak them, Up-Cycle them, then sell them. 31. Have you seen the new "Corner Libraries"? The little house shaped Libraries that are popping up everywhere? Why not an older Bicycle hooked to an older but waterproof Bicycle Trailer parked and locked down as a little FREE Library? 32. Weather Permitting... Deliver your Christmas Gifts to neighbors and friends using your Bicycle Trailer. You might even dress like Santa. 33. Weather Permitting... Deliver Christmas, real quiet like, so no one knows who brought the loot, in the middle of the night, to a family down on their luck. 34. Be a Hero! Take your young Niece or Nephew or Neighbor Kids for a ride around the town. Stop and buy them an Ice Cream Cone....clean them before letting them back into the Trailer for the ride home. 35. 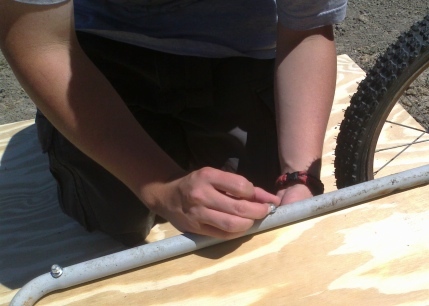 Convert or Create at Bicycle Trailer to pull your light weight Boat, Kayak, or Canoe. 36. Set a Trend. Ride you bicycle to school, the way people did a few years back. Use the trailer for days when you have too much to carry inside panniers or other bags. 38. Start a Business or Volunteer to deliver Groceries and other items needed to Shut Ins and the Elderly. Use your bicycle and trailer to make these delivers. Again, Word of Mouth, doing this, will grow your business. 39. If you work not too far from home, and need to take a tool box with you to work, use a Bicycle Trailer to haul your tools. 40. Put on Children's Birthday Parties in your area. Load up your Bicycle Trailer to haul all the items needed to entertain the children. Again, word of mouth of how you arrived and left and how you hauled everything will propel your business. 41. Use a Bicycle Trailer to haul a lined Trash Can and Pooper Scooper and start a Dog Yard Cleaning Service. 42. Load up a Cooler full of ice with soft drinks, on a warm or hot day, ride around your neighborhood and give a drink to all your neighbors out working on their property of vehicles. Great way to meet new people in your area, nice way to keep in touch with others. 43. Load up Sandwiches with the cooler of Soft Drinks and stay longer to visit your neighbors. 44. Contact a school or 4H program near you. On Arbor Day load up baby trees and deliver to the kids and plant them with the kids as you talk about the environment and how people can help keep it clean and have fun doing it. 45. Take a Basket of Goodies to an injured Veteran near you on Veteran's Day. 46. Do you know a lonely widow or widower? Take some candy and other gifts, like groceries, by on Valentine's Day. Stay and visit for a while. 47. Looking for Love? Take your trailer behind your bicycle on organized rides (offered in most towns and cities by Bike Shops) pull you dog with you. OR: Do you have a neighbor you would like to know better but she has a young child? Go by and ask them to come Bike Riding with you....pull the child yourself. No better way to win the kid over who will be talking about it for weeks to come. 48. If your children AND family dog do not fit in the same trailer, add a hook to the back of your children's trailer and attach another trailer to it and let the dog ride in the second pull behind bicycle trailer. 49. Load up the Bicycle Trailer with your dirty laundry and detergent, and off to the Laundromat. Don't forget your quarters for the machines. 50. Need parts to work on your vehicle that is not running, or is not running correctly? Use your bicycle and trailer to go and pick the parts up. 51. When you are having a Garage Sale, set your bicycle up with the trailer hooked to it out in the front yard. Put the Garage Sale Sign using your bike and trailer to prop it against. The bike and trailer will catch the eyes of a lot of folks going by. 52. Loan your Child's Trailer out to a neighbor, friend or relative that might not be able to afford one themselves...however, make it perfectly clear you want the trailer back when they are no longer using it for their own children. 53. Load up your guns and ammo and take a trip to the Shooting Range. 54. Are you a hunter that might be able to use your bicycle and trailer to load up and get out further into the woods? Be sure to take something to wrap up your game so that the blood does not stain your bicycle trailer. 55. If your dog can not run the whole way with you on the Bike Path, but you would love for it to come with you and get the exercise, give the dog a ride out and let it run, on a leash or on a Spring Bicycle Attachment (best way) and goooooooo! 56. Ride to the Pet Store and bring home a new Hamster and Cage with Accessories. 57. Need to buy your school supplies for the year? Why not ride your bike to the store and buy all you need. Carry them home in your Trailer. 58. Friend invite you to a Camp Fire? Run down to the store and buy Lawn Chairs, Drinks, Gram-crackers and Marshmallows. 59. Near Christmas? Buy the battery type Christmas Lights and decorate your Bicycle Trailer. Not only will it look festive, if you ride at night the lights will give you extra protection by others being able to see you better. 60. Christmas Time? Wrap up your little kids and take them Christmas Caroling around the neighborhood. 61. Need to hide a Christmas or Birthday gift? Tuck it away inside a Bicycle Trailer in the basement or garage. 62. Have you seen the Bicycle Trailers that are fold out Tents? 63. If you have a Storage Tub that needs to be taken down to the Storage Building, load it up into your Bicycle Trailer and go. 64. Use the project of washing and cleaning your Bicycle Trailer as an activity to do with your kids. Teach them how to clean the vehicle that they love. 65. Build a Bicycle Trailer, or Up Cycle a Bicycle Trailer, with the child that outgrew the one you will be using for your base or frame. Schedule a Camping/Touring trip the distance your child can ride their own bicycle in the few days to follow. 66. Call it Recycle, or UpCycle or Trash Backwards, using the frame of a Bicycle Trailer that is used up, to make a Grill Holder to take to friends or camping or other fun places to cook up some good grilled food for others. 67. Have you seen the Bicycle Trailer that are made for someone, adult, to stand on as they are being pulled along? 68. Fill up a cooler full of soft drinks and show up on your bicycle, with trailer full, at your child's ball game. Let your child share drinks with all the kids. 69. Load up tools such as Chain Saws, and Hatchets, into your Bicycle Trailer, to take with you as you volunteer for Bicycle Trail Clearing and Cleaning. 70. Reupholster a Child's Trailer and pass it down to the next generation. 71. Does your dog love to ride in your Bicycle Trailer? After a bath, does your dog have a place to go to dry? Let your dog sit, and shake off, inside your Bicycle Trailer it normally rides in. After the dog is out of the Trailer, leave the trailer in the sun to dry. 72. Do your neighbors have new baby Guinea Pigs they are offering for sale or FREE to a good home? Put a box in your Bicycle Trailer and go and look, you might just fall in love with a new Family Member! 73. You might be surprised to hear that a Guinea Pig might just love to ride in that Bicycle Trailer as much as a dog does. However, Guinea Pigs are not house breakable. Place the Guinea Pig in a Crate or Cage or place a couple of towels on the seat of the Trailer. Guinea Pigs can be trained to do many things a dog can do too. They make great pets! 74. Did your neighbors dog come over to your house again? Do you need to run him home? How about a fun ride in your Bicycle Trailer? 75. Great way to bring home a lot of items from the Farmer's Market in your area. Also a great way to meet others you have a lot in common with at the same place. 76. Do you use a neighborhood garden? Use the bike and trailer for working on, carrying tools in the trailer, or/also to bring home vegetables from the garden area. 77. Go pick up dinner from the local Burger Joint. Take an empty bucket to set the drinks down into...the bucket gives the drinks a more stable area to ride in, and if one or more leak, or spill, the bucket catches the mess. 78. 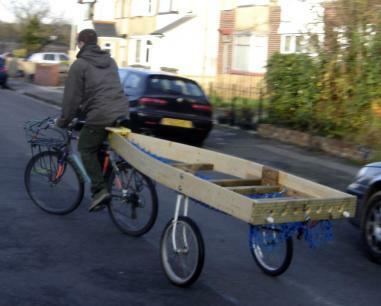 Upcycle a Bicycle Trailer into a wooden box, as large as the bike that is pulling it will allow. Plant a Garden into the Trailer. This way you can move the Trailer Garden in and out of the sun, to water it, and out of the bad weather when you hear it is coming. When harvesting time comes, pull the Trailer Garden indoors and harvest away. Empty the the rest and use the trailer for other tasks the rest of the year. 79. Upcycle your Bicycle Trailer into a Barrel for Beer. Enjoy that you can take it with you anywhere you go. 80. At Easter haul around a big Stuffed Rabbit. 81. Have the group you ride with, just for fun, bring trailers that they have decorated on one of the upcoming rides....set up some ideas, such as Most Filled, Brightest Colors, Live Cargo, ext. 82. In the Winter haul around Kitty Litter, Salt and a Shovel. Help people who's vehicles get stuck....THAT would give them something to think about! 83. Use your Bicycle Trailer to go and pick up your Pumpkin in the Fall. 84. Load up items you like to use at the Beach. Park the Trailer near where you are and use it for shade if the sun is too much for you. 85. Take your Trailer with you to the Pet or Grocery Store to pick up the Dog Food you forgot when you were out last. 86. Use a Trailer to haul home the Dog Food, Cat Food, Small Pet Food and Shavings as well as Fish Food from the Pet Store. 87. Deliver all those Girl Scout Cookies with a Bicycle Trailer. 88. Apple Picking Season is such a beautiful time of year to ride a bike. Take your Trailer with you and bring home all the apples you can haul behind you. 89. 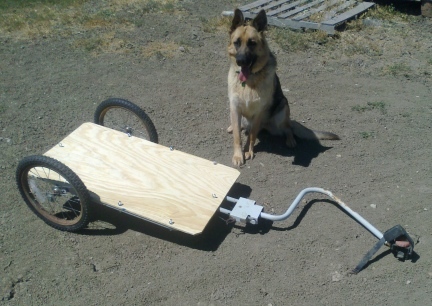 Deliver your dog to the Dog Groomer with you Bicycle Trailer. 90. Pick your dog up from the Groomer with your Bicycle Trailer. 91. Buy a Child's Bicycle Trailer for a Baby Shower Gift. 92. Buy a Cyclist a new cargo Trailer for a Christmas or Birthday Gift. 93. Use your Bicycle Trailer for hire. Start a Delivery Service in your area. 94. Disaster in your area? Fill your Trailer with Paper Towels and give them out for people to clean up their homes. 95. Use your trailer, with a big sign, to advertise for your business (of any type). 96. You could also use a Bicycle Trailer, with a big ole sign on it, to advertise for your favorite candidate...any type of office. 97. You could also turn your Trailer into a place to carry all sizes of people and call it a Pedicab. 98. Have Bibles inside your Bicycle Trailer and give them away to people you talk to about the Lord. 99. Get a job, or volunteer, to pick up trash at a Park after a 4th of July or other event. Use the trailer to haul the trash away. 100. Load your blanket and treats as well as snacks and flashlights into your Trailer and carry these items to the Park on 4th of July. MAKE SURE YOU HAVE A LOT OF LIGHTS ON YOUR BICYCLE BEFORE RIDING IT HOME IN THE DARK. You might just ask a friend with a Pick Up Truck for a ride home. 101. Hang on to that Trailer, you never know what might come up that you might use it for. You will probably need to buy new Tires and Tubes, and perhaps, in some cases, Wheels. Not just any Tires, Tubes and Wheels, some that will fit the Trailer you are Converting. Proper Tools for the type of job you will be doing. How are YOU going to Convert Your Trailer? Think, Plan, then Buy the Materials, and Find the Proper Tools for the Job. 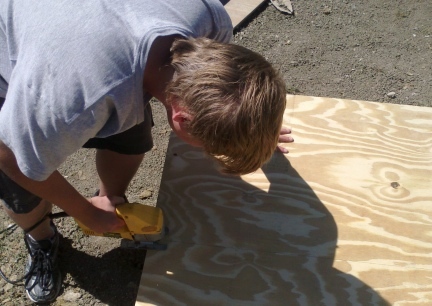 We used I-Bolts, a Good Grade piece of Plywood. 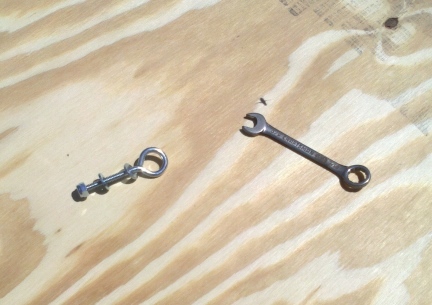 The Trailer we used still had good, all be them, old style, attachments for hooking to our bicycles. Sometimes, "Don't Fix It If It Ain't Broken'", applies. We chose to keep these since they are still in good repair and working. MEASURE, MEASURE, MEASURE! And then, measure again! 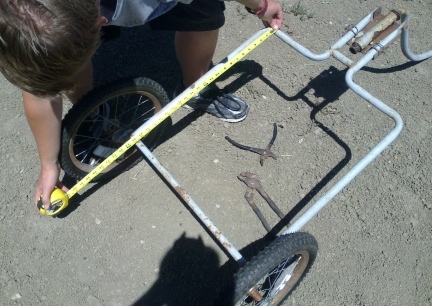 Measuring the Bicycle Trailer to be turned into a Bicycle Trailer for Touring/Bikepacking/Bike Camping. We used eye bolts so that on the top side the O in the bolts can be used for tying down the loads securely to the Trailer. I took this photo a little to early, I should have let the Bicycle Trailer to straighten out behind the bicycle. But here it is, Upgraded and ready to go! I need to take more photos of us using this Trailer out on the Trail. 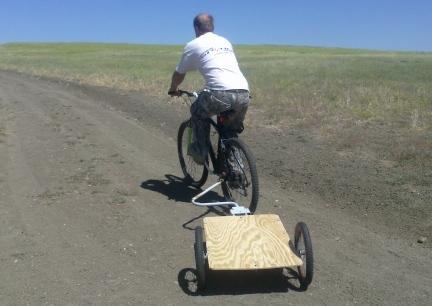 Your Bicycle Trailer Project is Your Own. We assume NO RESPONSIBILITY for your Workmanship or Safety when Building or Using YOUR Own Trailer. This is a Project and Trailer Recycle that has worked well for us. 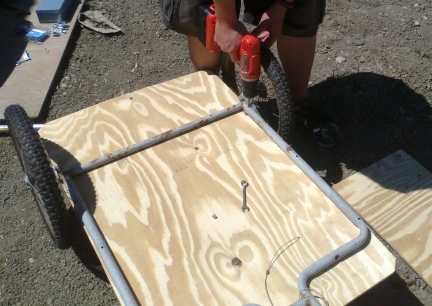 The above are just ideas of what you might well do with an Old Child's Bicycle Trailer to convert it for further use.